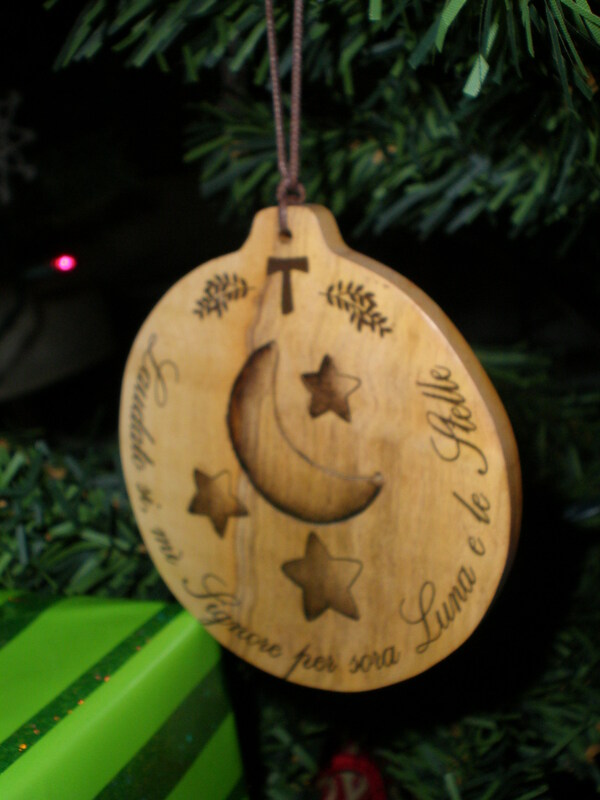 I purchased this wooden ornament in Assisi, Italy when I visited in 1997 from an artisan/souvenir seller up one of the old streets. It says "Laudato si, mi Signore per sora Luna e le Stelle" which translates "Be praised, my Lord, through Sister Moon and the stars" from Saint Francis of Assisi's Canticle of the Sun. While at the Franciscan Basilica there--which subsequently suffered serious damage during an earthquake later that same year--I overheard a Franciscan monk giving a tour. My ear perked up because I clearly recognized the accent. He was from Western Pennsylvania. So, after he was done, I approached him. Sure enough, he was from Somerset, PA. He was a character--simultaneously very brusque and comedic. He asked me, when I returned home to Pittsburgh, to call a family for him. They had a Polish last name, and he called them the "chickies" after their name. I never got to speak with them, but I did leave a message for them from him on their answering machine.